Despite two decades of investment in improving mental health services, the mental health of Australians has not improved. This lecture argues that we have used a one-pronged approach to improving mental health, where a two-pronged one is required. There are two broad ways of decreasing the number of people with mental disorders in the population. One is to reduce the number developing mental disorders (prevention) and the other is to shorten the length of time people have a disorder once it has developed (treatment). In Australia, as well as other countries, we have invested primarily in the treatment prong, but neglected the prevention prong. It is argued that the next wave of mental health reform in Australia needs to focus on the second prong. Prevention of mental disorders can be carried out in many settings, including families, schools, tertiary institutions and workplaces. Some possible elements of a national prevention strategy will be outlined. An article based on this lecture has been published in the Australian and New Zealand Journal of Psychiatry. Professor Jorm’s interview Radio Australia Interview Link. 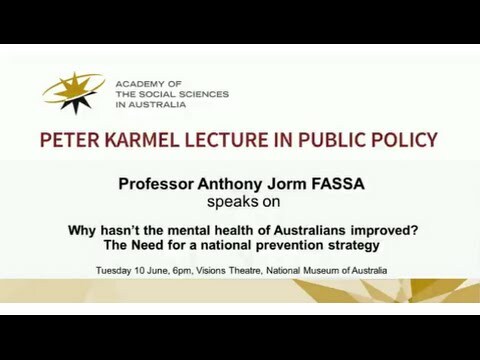 Professor Anthony Jorm FASSA, is a Professorial Fellow at the University of Melbourne and an NHMRC Australia Fellow. His research focuses on building the community’s capacity for prevention and early intervention with mental disorders. He has been listed in ISI HighlyCited.com as one of the world’s most cited researchers in Psychology/ Psychiatry.